The secret to giving a great present, regardless of how much it cost, is to be thoughtful about it. Most men have trouble deciding what to get as gifts and end up with the common choices of fragrances, jewellery and electronics. Of course, there is nothing wrong with all those ideas, but you want the recipient to feel appreciated and that it took more than a few minutes to pick out the gift. A little imagination comes in handy when thinking up gift ideas. First, consider what the gift is meant to say; is it thank you, goodbye or congratulations? Then, you must know what the recipient’s preferences are to find the most suitable item. Here is some help with a few ideas to get you started. 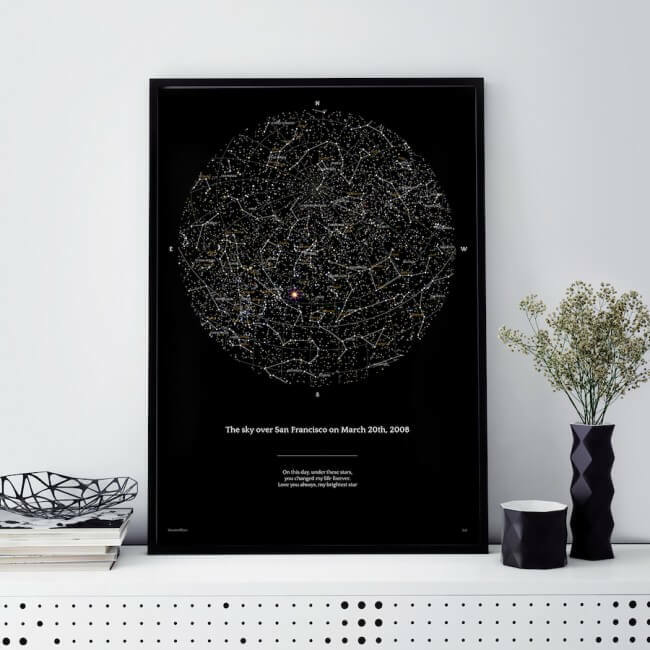 A night sky map can say a lot when given as a gift. The map contains an image of the sky as seen on a particular night. This gift idea gives you an opportunity to add an extremely personal touch. You can pick any day that is important to the recipient. If it’s a significant other, it may be the day you got together. For a sibling, the map can show the best as they were aligned when he/she was born. If it’s a work colleague, it can be the night sky on the day of a big achievement. The options are limitless. You need not do much to get the gift. Once you have a suitable place to buy the map, you only have to pick a specific night sky. You can get a customised frame to add life to the map. Further personalisation may include a special message to accompany the night sky image. It’s an impressive way to remind a person that he or she is important. People collect many keepsakes over their lifetimes, and some of them get lost along the way due to poor storage. A memory jar can solve that. You can get your friend, relative or colleague a simple memory jar to keep all the small items that have sentimental value. From letters from one’s first love to seashells from an unforgettable holiday, a memory jar can hold a lot of sentiments. You can give a memory jar as a present on any occasion whether it’s a birthday, Christmas or anniversary. If you are gifting a person who is passionate about giving, then a dedication in his or her name can make the perfect gift. Find out the cause that your recipient loves such as education, art or health and donate what you can to a suitable charitable foundation. Another way to donate is using the name of your recipient’s lost loved one; it could be a sibling, parent or significant other. Such a gift shows how much you know the other person. When gifting on a budget, home-made crafts are excellent options when searching for thoughtful presets. You only have to buy supplies and find instructional videos online. DIY gifts offer limitless options because you can create anything from jewellery to art to decorative pieces. If you are good with your hands, go with a homemade present because it shows more thought. DIY gifts are also easier to customise because you are making them from scratch – it doesn’t get more personal than that. When you are hard pressed for money, you can easily offer your time as a present. The idea behind time as a gift is to spend it doing something that the other person is interested in. For instance, if it is a grandparent, you can offer to have a park picnic or go fishing. You can spare an hour or so to teach your mum or dad how to use a new gadget (without complaining about it). Coming up with a thoughtful gift is not hard when you know what the recipient is passionate about, his or her interest and what you are willing to spend. Take the time to find a present that reflects on the personality of the recipient.